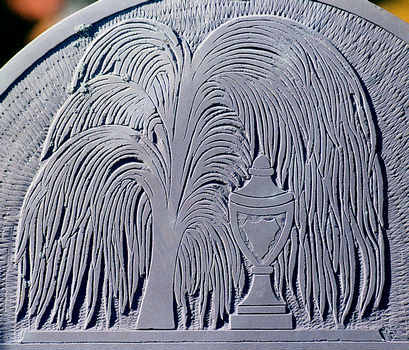 Weeping willow trees arching over some kind of vessel are the most common slate slab stone designs in New England. Burying grounds opened after 1800 have little else. The earliest of this design appeared around 1780 and by 1810, carvers were no longer making skulls and faces. Populations grew, people were richer, and the cost of stone markers became affordable for many more families. A shallow intaglio carving like the one on the left could be done quickly and cheaply, carving the inscription required more skill. Deep trees on the right are rare because they required more time and experience to carve. Trees range from spare "stylized" virtual trees to classic willows. The vessels beneath the trees represent either urns or lamps. The rounded-top vessel on the left is probably an urn while the texture disappearing in the shadow on the right is a lamp flame. The urns are not for ashes (especially being above graves), cremations started 50 years after these stones were set. The oldest tree / urn stone in my collection is Elizabeth Hurd's 1779 stone (left) in Boston's Granary Burying Ground. The vessel is clearly an urn and the "tree" is a couple of branches bearing simple leaves arching over it. The carver used the entire stone face and put the inscription on the urn. The same design appears on Tobias Lear's 1781 stone (right) in Portsmouth NH Old burying ground contained within the inscription panel. Above it on the tympanum is the older two-boned skull design. The 1802 stone of Nathan and Elizabeth Tripp in Boston's Central burying ground is like the Lear stone in having both a winged face and a vessel (lamp?) flanked by the same kind of generic trees. Carvers were eager to embrace the new designs but reluctant to abandon the old entirely. The Ebeneezer Kent 1806 stone in Leicster MA has a simple, round face with outline wings within a round-topped urn. The tree appears more willow-like but is not yet the full weeping willow. A vine weaves back and forth up the tree's trunk. Betsy Shaw's 1793 stone in Plymouth MA is unique. The urn is off to the right, not under the tree which is, in any case, neither willow nor weeping. A winged face hovers over a structure that looks much like a table-stone tomb. This stone was set into a granite housing probably because the slate was delaminating. Lichen obscures some detail and the face has been vandalized. By the grace of milonic, Nov 12.